How to Convert PDF to DOC/DOCX on Mac/Windows 8/7? Reading and sending files in PDF format is great since PDF has a unbeatable capacity in keeping appearance and layout in different platforms. However, PDF is not perfect. The most annoying thing about PDF is that we can edit it. How anxious when you find a big error on your PDF report but have no solution! Thankfully, there is an easy way to make your PDF editable: convert PDF to DOC/DOCX, the standard formats for Microsoft Word documents, which are editable. To convert a large number of PDF files to Word DOC or DOC format, we suggest you use the versatile Coolmuster PDF Converter Pro (for Windows users) or PDF Converter Pro for Mac (for Mac users), which acts as a professional PDF to DOC/DOCX converting tool on Mac and Windows platforms. The output document quality is super high with original text, tables, image and layout highly preserved. After converting, it will be easy for you to copy, highlight and edit PDF content. 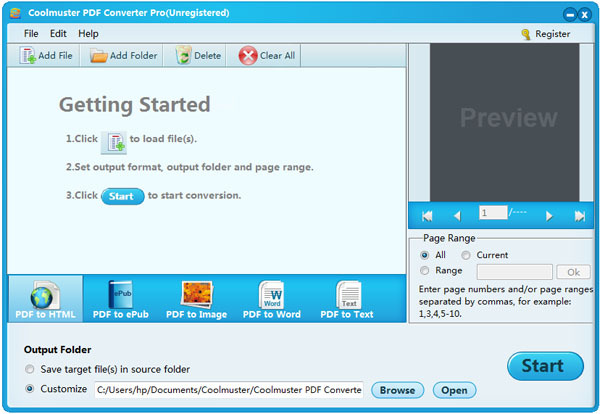 Launch the Mac PDF converter on your computer, drag and drop PDF files to the software, or you can click "Add Files" or "Add Folder" to load the target PDF files to the software. Several PDF files can be loaded to the Mac tool at a time. Choose the conversion type as "PDF to Word" and then choose .doc or .docx as the output format. Click "Browse" to choose an output folder for saving the converted documents. Make sure there is enough space in the specified location. 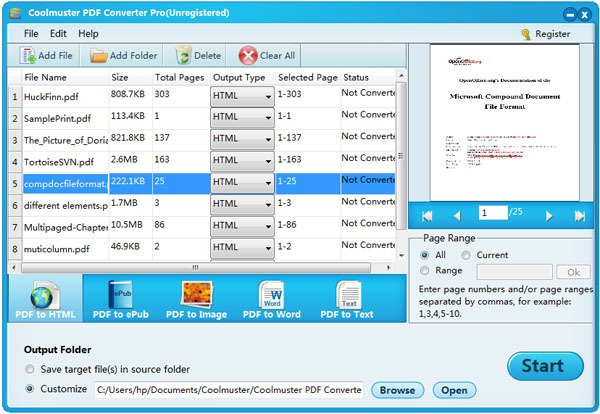 Tip: One of the main features of the PDF Converter Pro is that you can set page numbers or page ranges of the PDF to convert specific pages to DOC or DOCX documents. Press the "Start" button to launch the conversion process and the program will complete the whole task in a few seconds. After that, you can go to the output folder to get the output DOC/DOCX documents. After you download and install the program on your PC, run it and you'll get the main interface of the program like below. First import the PDF files, you can drag and drop a batch of PDF files to the interface or you can click "Add Files" or "Add Folder" to load the target PDF files to the software. Select the conversion type as "PDF to Word" and then choose .doc or .docx as the output format before converting PDF to DOC/DOCX. Then, specify an output location where you want to save the exported DOC/DOCX documents by clicking the "Browse" button. Tip: You may choose to convert specific PDF page range or page numbers from the "Page Range" window on the right interface. Finish above settings, you can hit on the "Start" button to begin the conversion process. The conversion only takes a few seconds and you can get the output DOC/DOCX documents by clicking the button of "Open". Done! 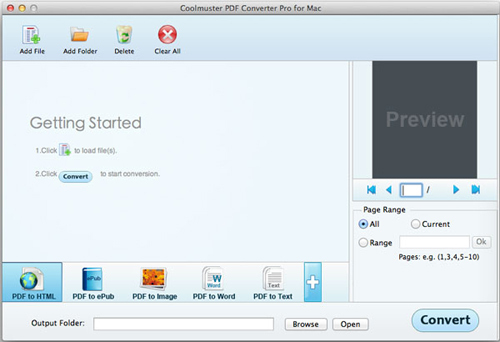 This is how to convert PDF files to Word (DOC/DOCX) documents easily and quickly with Coolmuster PDF Converter Pro. Free download it to get the conversion task done without any hassle.